If you’ve been checking your email account regularly, perhaps you’ve noticed a trend. 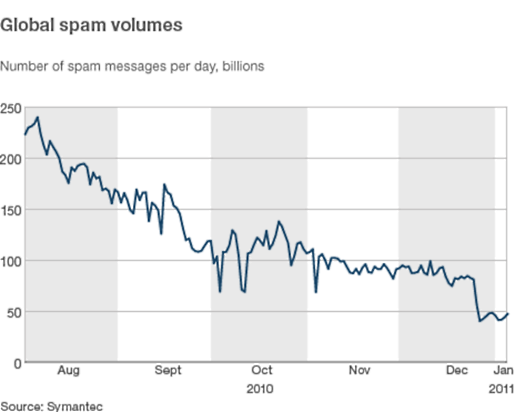 Spam emails are on the decline worldwide. In August, there were 200 billion spam messages delivered on a daily basis; in December, that number dropped to 50 billion. That’s a drop of 150 billion spam messages in 5 months. In recent months, several massive email spam collectives have ceased their operation, including Rustock, Spamit, Lethic, and Xarvester. Spammers are being attacked in court by legal crusaders and email inboxes are smarter about fighting spam messages. Perhaps the business of spamming isn’t as profitable as it once was and that’s what’s driving the amount of messages down.